This critically endangered species is the largest of the aquatic frogs, reaching up to 50cm in length and weighing up to 1kg. It is endemic to the Lake Titicaca basin in the high Andes of Bolivia and Peru. 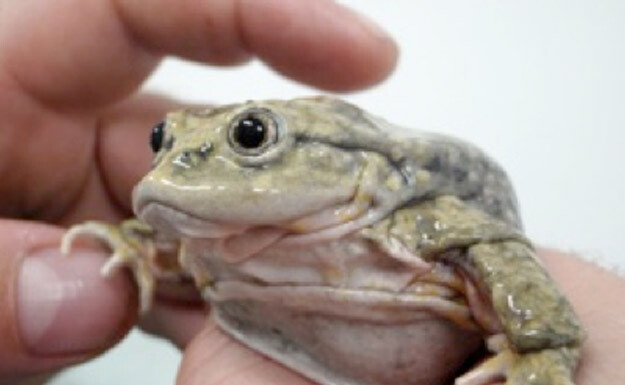 The Lake Titicaca Water Frog is severely threatened; populations have declined by 80% over the last 3 generations. We are the main sponsor of a project being carried out by Stiftung Artenschutz to assess the threats and conservation status of the Lake Titicaca Water Frog. The biggest challenges faced are over-exploitation, destruction of habitat and the introduction of non-native species. Lake Titicaca Water Frogs are among several species traditionally collected and consumed by Locals. In Lima, the frogs are prepared either in a soup or in a frog “shake”. It is also believed they have medicinal properties and they are used as a treatment for conditions varying from headaches to epilepsy. Many local populations are unaware of the dramatic decline in the Lake Titicaca Water Frog numbers. The conservation project we are funding will be concerned with raising public awareness of the plight of this endearing frog.